THE "ORIGINAL RESCUE AIR CHISEL"
This is the “original" AIR CHISEL, designed and manufactured to the exacting standards of the Emergency Squad Training Institute. It is designed for rescue professionals, as the most powerful air hammer in its class, combining compact size, reliability, quick set-up and ease of operation. 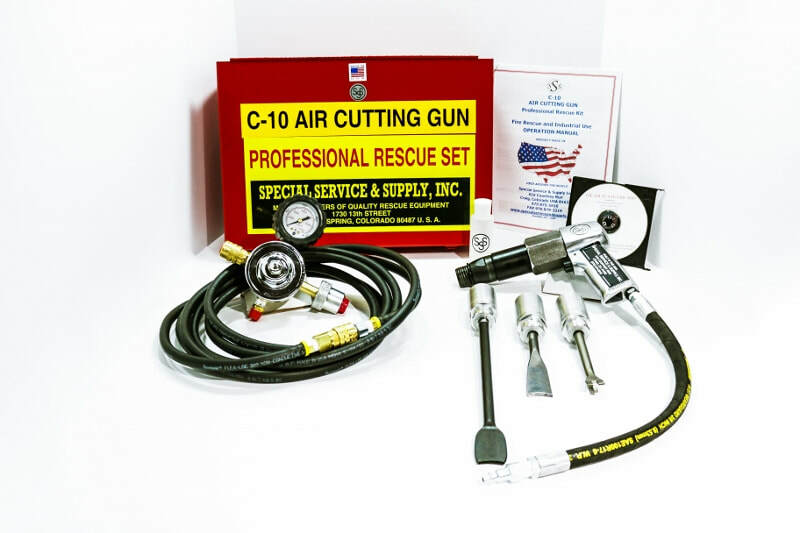 The "C-10 "ORIGINAL RESCUE AIR CUTTING GUN SET" is designed to rapidly cut heavy metal including quarter inch (1/4”) mild steel plate, three quarter inch (3/4”) mild steel bolts, automobile safety door lock bolts, vehicle door posts, automobile roofs, vehicle and aircraft seat brackets, fiberglass, carbon fiber, aluminum, metal buildings, metal roofing﻿ and sheet metal ducts in a matter of seconds. The C-10 AIR CUTTING GUN has the lowest air consumption of any air hammer in the industry. The "Original Air Cutting Gun" is often copied, but it's performance is never duplicated. 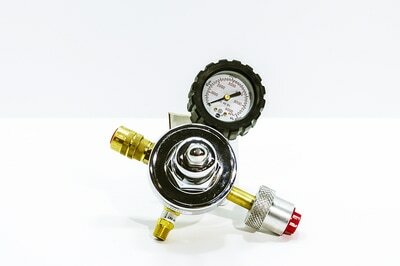 The factory preset single stage air regulator requires absolutely no adjustment, eliminating the possibility of the operator selecting the wrong pressure and damaging the regulator or air cutting gun. It is designed to provide a constant air flow rate in excess of 4 C.F.M., while operating from any supply air cylinder equipped with a C.G.A. valve, within a pressure range from 400 PSI to 5,500 PSI without the need for any adjustment or tools. This heavy duty regulator is equipped with a safety relief valve, the gauge is protected by a shock absorbing rubber guard, and a hand tight nut rapidly attaches the regulator to the air cylinder without the need for tools. All air regulator components are designed to provide rapid setup, high strength, and years of reliable trouble free service backed up by an unprecedented seven year warranty. 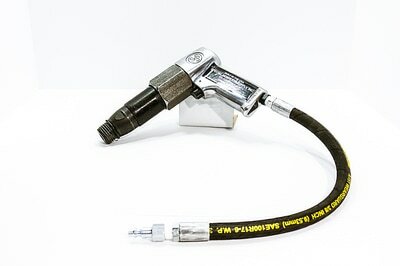 This rescue air cutting gun is equipped with an eighteen inch long, high strength, high pressure whip hose at the base of the handle to provide an ISO 18752 Performance Standard exceptionally cut resistant hose with great flexibility, eliminating the problems and movement restrictions caused by air fittings at the base of the air gun handle. The supplied .401 shank, turn type chisels were designed to provide the operator with the ability to quickly and easily change cutting direction simply by moving the chisel. 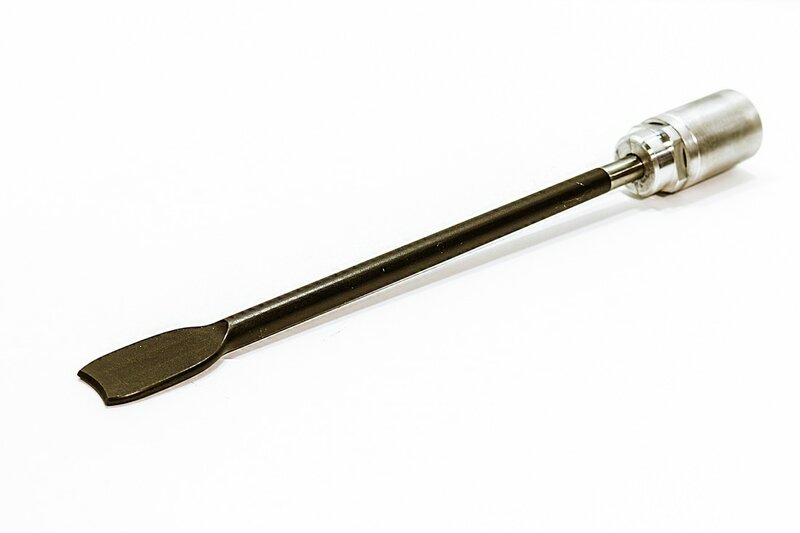 The chisels included with this set provide rapid forcible entry into vehicles, aircraft, metal buildings, fire doors, security grates, garage doors, machinery, ventilation and exhaust ducts. Special purpose chisels are available for breaching concrete, masonry, brick and block walls, busting thru spot welds, cold chisel cutting and scraping. 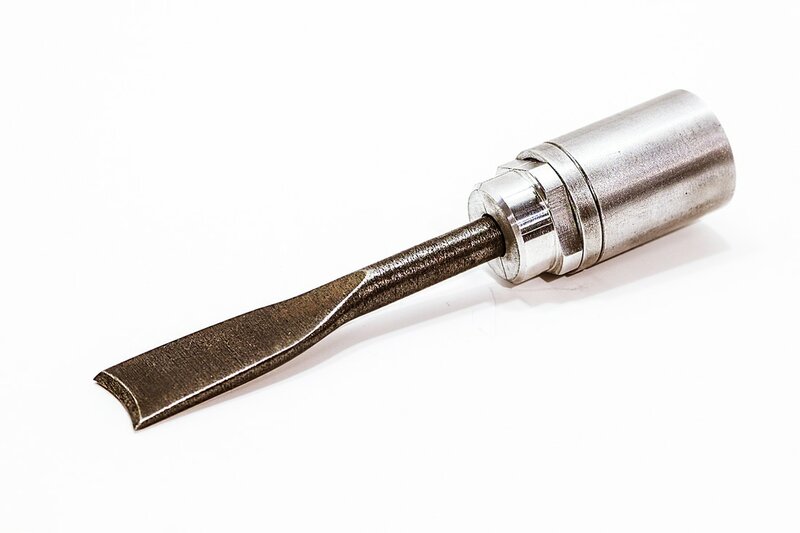 Our patent pending quick change screw type, safety chisel retainers are designed to provide the security and safety of positive chisel retention not available with spring type chisel retainers, combined with the ability to turn the chisel. The quick change retainers screw onto the air cutting gun in seconds, allowing rapid chisel changes without tools. Every C-10 AIR CUTTING GUN SET is supplied with a heavy duty, 16 gauge steel storage box capable of being locked or sealed for tool security, fifteen foot long air hose with fittings, 18" cut resistant whip hose on gun with quick couple fittings, pre-set air regulator with an operating range from 400 P.S.I. to 6,000 P.S.I with out the need for adjustment, heavy duty air cutting gun, 3 quick change chisel safety retainers, long flat chisel, short flat chisel, panel cutter chisel, 2 ounce dispenser bottle of lubricating oil, an instruction video, Operation and Maintenance Manual, all backed up by our exclusive manufacturer's warranty and support. The heavy duty metal storage box with regulator mounting post and chisel storage compartment measures 16" x 11-1/8" x 5-3/4", small enough to fit in any emergency vehicle..
Often imitated, but never duplicated, the C-10 AIR CUTTING GUN is the most powerful air hammer in its class. This air cutting gun was specifically designed for rescue and extrication. Designed and manufactured to the rigid specifications of, and approved for use by EMERGENCY SQUAD TRAINING INSTITUTE, inventors and designers of fine RESCUE and EXTRICATION EQUIPMENT. Innovators in RESCUE and EXTRICATION TRAINING. This is not a “muffler shop air hammer”. The C-10 air gun set has an unprecedented full two year warranty against defects in material and workmanship. The air regulator has a full seven year warranty. These are the longest warranties in the industry. The ideal forcible entry tool for FIRE DEPARTMENTS, RESCUE SQUADS, U.S.A.R. TEAMS, POLICE DEPARTMENTS, SWAT TEAMS, the MILITARY and anyone involved in EXTRICATION and RESCUE. 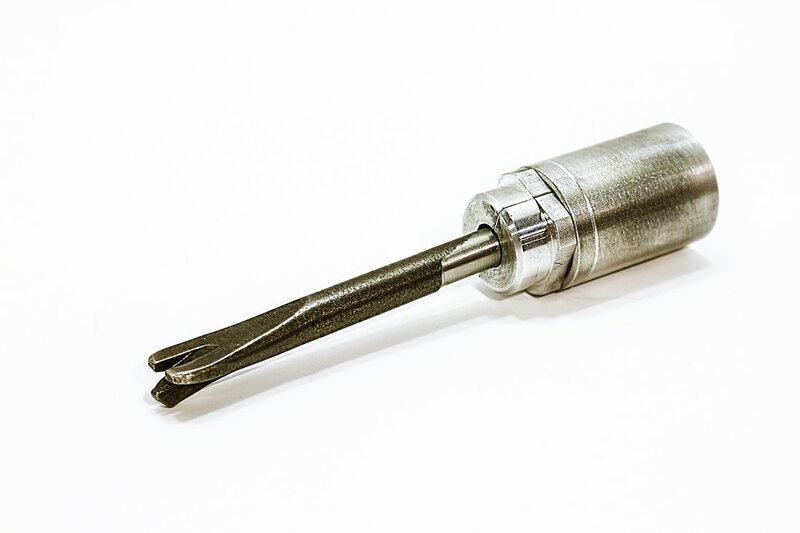 In addition to the chisels supplied with the "ORIGINAL" C-10 RESCUE AIR CUTTING GUN SET﻿﻿﻿, ﻿several types of special purpose chisels are available for those unique situations where the regular chisel isn't appropriate. These optional chisels greatly expand the versatility of the "Original" C-10 RESCUE AIR CUTTING GUN. Ships via FedEx Ground. Shipping weight 35 lbs. Overall Length ﻿﻿ 8 7/8" 21" + 9 1/2" 10" 9 1/2"
Weight 4.5 lb. 7 lb. 5 lb. 5 lb. 6 lb. Chisel Diameter .401" .4" .401" .401" .498"
Piston Stroke ﻿ 3 1/2" 3.875" 3 1/2" 3 11/16" 2 11/16"
Air Consumption 3.5 C.F.M. 5.2 C.F.M. 4 C.F.M. 4 C.F,M, 7 C.F.M. 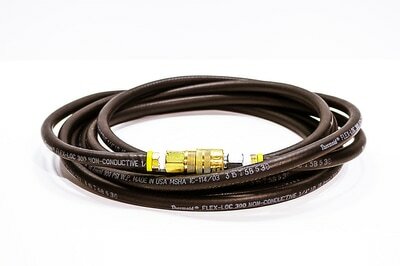 Air Hose Size 1/4" 3/8" 1/4" 1/4" 3/8"
sources YES NO ? ? ? * Spring retainers are not safety retainers and may launch a chisel during cutting operations.